Fast forward to March 29 and Wright was back on stage at the NAACP Awards collecting the statuette for Best Breakthrough Role in a Motion Picture. 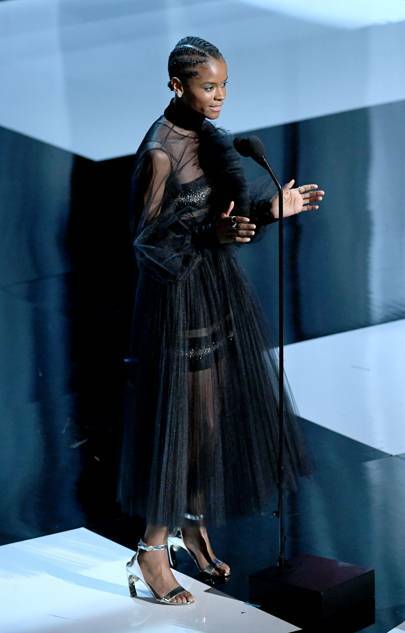 Wearing a black Georges Chakra embellished minidress and tulle gown over the top, she thanked her followers and her Black Panther family for all their support. Although the duo knew Georges Chakra’s double dress combo was “the one” the moment they found it, Wright’s decision to shine a spotlight on the Lebanese couturier boils down to her increasing knowledge about fashion. “We now collaborate and have conversations about the story we want to tell,” says Samuel of Wright’s research into designers and silhouettes. “We are still developing and growing, but that’s the beauty of having a client like Letitia,” Samuel muses. As Wright would agree herself, it’s the journey behind the moment that matters.